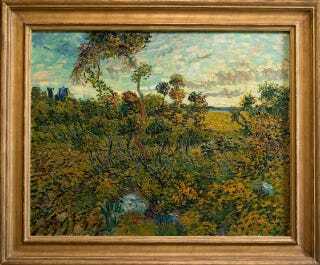 In the 10th episode of the fifth season of Doctor Who, the Doctor visited Vincent Van Gogh and destroyed an alien monster only the artist could see. In real life... well, apparently the same thing happened, because that totally looks like the TARDIS is in that recently revealed new Van Gogh painting. The Wall Street Journal "claims" that the blue, box-like structure is the Montmajour abbey, but I think we all know better: It's the TARDIS, the Doctor visited Vincent Van Gogh with Amy Pond and then took him to a modern Van Gogh exhibit, and Doctor Who is actually a non-fiction reality show. It's the only thing that makes sense, people.